Let our conversion specialist transform your next project so that it explodes in your face. We can bring EYE POPPING excitement to your next print campaign, web site, or computer presentation by converting your art, computer graphics or photos to jump off the page and into the next dimension! Give us a call for a FREE consultation and estimate on converting your next printed project or website promotion into 3-D. Want to check out our 3D gallery but you don't have any 3D glasses? 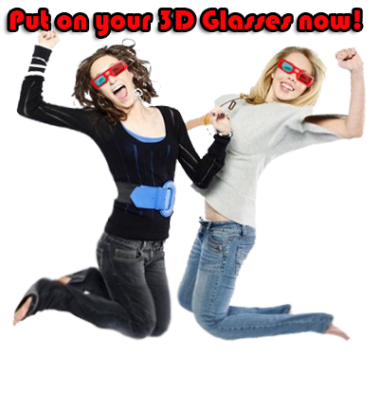 Email sales@3dglassesonline.com to request a free sample! Please remember to always practice safe 3D. Make sure you are wearing the right glasses for the right technology!